FRANKLIN, Mass. – At halftime, the Panthers were in need of a spark. Attleboro had packed the midfield and limited the home team to no shots on target and a single corner. Franklin huddled during the break, discussed the situation, and came out for the second half on the front foot. 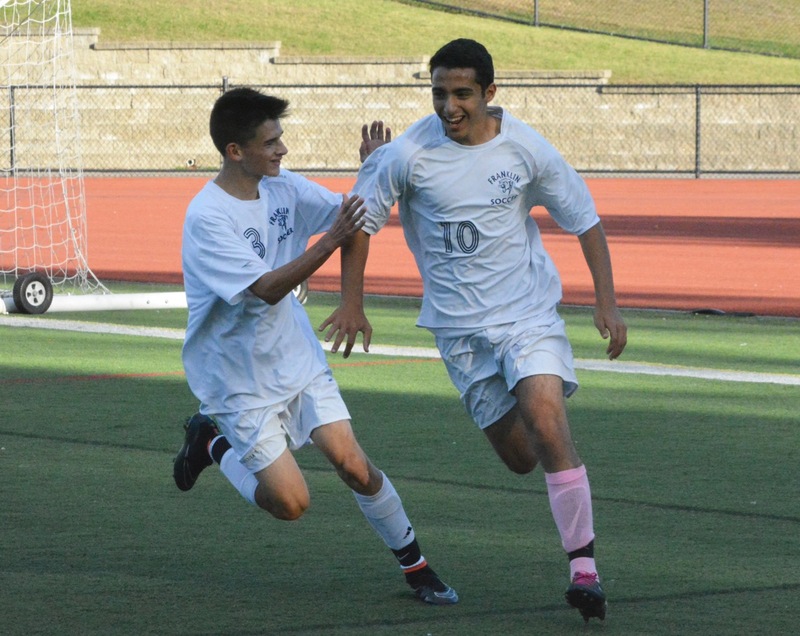 Senior Hatim Brahimi scored what turned out to be the game-winner 12 minutes after the break and added an assist on the first of Kevin Hall’s two goals as Franklin beat the Bombardiers 3-0 on Friday afternoon at Pisini Field. With the victory, the Panthers clinched a return to the state tournament and, coupled with a Mansfield draw against King Philip, moved into a tie at the top of the Kelley-Rex standings. “Mostly, they talked about things that they had to do better and just went out and executed it,” said Franklin coach Fran Bositis about the halftime team talk that spurred his team to victory. The first big chance of the game fell to the visitors in the third minute. Junior Coca played a through ball into the path of Ahijah Joseph down the right channel. The junior blazed his shot inches over the bar. It would be the best chance that either side would have in the opening 40 minutes. “I thought that in the first half they were beating us in the air and doing a better job than we were of kind of controlling the tempo of the play,” said Bositis. Attleboro used three at the back, with right sided defender Brandon Aldana having a particularly impressive game, and loaded the midfield to stymie the Panthers coming forward and to allow more possession for Harry Lancaster, Zach Rodrigues, and Coca. The best that Franklin could do were a few balls through the Attleboro back line towards Hall and Brain Czuba, but they were cut out by Attleboro keeper Tyler Stowe. After not putting a single shot on target in the first half, Franklin made sure to rectify that in the opening two minutes of the second. Czuba cut a pass back to the edge of the 18 to Brahimi who took a touch and curled a shot towards goal that Stowe parried at full stretch. A minute later and Brahimi ran onto a through ball from Austin Kent but again Stowe was quick off his line to block the shot. In the 52nd minute, Brahimi finally got his goal. Again it was Kent that provided the assist on a perfect slide rule pass between defenders, who turned towards the officials with hands up hoping for an offsides call that was not forthcoming. Brahimi took an extra touch and slid the ball inside the far post to give Franklin the lead. Attleboro had a few chances to try and tie the game. Coca had a 20 yard free kick that he curled around the wall but right at the well-positioned Henri Guilmette (five saves). Five minutes later, Attleboro had another chance when Devin Andre found space on the left and picked out Lancaster but again Guilmette got down quickly to save. In the 66th minute, Brahimi showed the other part of his game when his deft flick sprung Hall behind the Attleboro defense and he was able to beat Stowe to the far post to make it 2-0. With three minutes remaining in the game, Hall wrapped up the win when he ran onto a under hit back pass and lifted the ball over the stranded Stowe to make it 3-0 and continue his torrid scoring record over the past few games. The defeat knocked Attleboro out of playoff contention. It is the first time that the Bombardiers have missed the postseason in a number of years. Franklin (9-4, 8-4) will face off with Mansfield on Monday in a battle of the two teams tied for the division lead. Attleboro (3-8-1, 3-9-1) will host Taunton on Monday night.